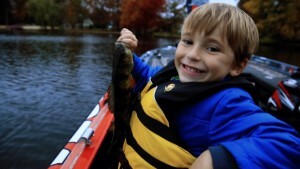 Everybody talks about getting kids interested in fishing. Talk is good, but action is better. I’m a firm believer that the only way fishing will survive and grow is through the next generation. Getting adults out on the water won’t help a thing 50 years from now. Start with a cheap bobber and a No. 10 hook. Tie the hook a little ways under the bobber and you’re good to go. From there all you need is a worm, a nightcrawler or maybe a cricket. If you can’t get your hands on live bait, use Berkley Gulp! It’s just as good and since it’s already dead you don’t have to worry about keeping it alive. Don’t worry about anything more than that. You don’t need to go to a legendary lake and you don’t need expensive tackle. Almost any body of water will have little bluegills, crappies or catfish swimming around the shore or the dock. (A farm pond is probably your best bet.) And almost any rod and reel combo will help the little ones fight a small fish like that to the finish. You see, this first step isn’t about fancy and it isn’t about big fish. It’s about catching something, something they can reel in and be happy about. You want these early experiences to be positive. You want the kids to laugh and have fun. What you think doesn’t matter. What they think is what matters. Make sure you take a picture. Actually, a video might be better. They can show other members of the family and their friends what they did. After they have several trips under their belt, and when they get a little older, buy them a spincast or spinning rod and reel combo. Again, it doesn’t have to be fancy or expensive. If it’s good enough to cast and retrieve, it’ll do the job. No kid can resist this little face! Buy a bag of grubs and a few round ball heads and let them cast and retrieve. They’ll think that’s a big deal and if you use small grubs you’re almost certain to catch something. I mean, anything that swims and anything that calls itself a predator will bite one of those things. You can buy everything I’ve mentioned through Abu Garcia, VMC and Berkley for very little money. The program I’ve outlined is about spending time, not dollars. The sum mary here is that you need to see things from a kid’s perspective. Forget about bass fishing, especially tournament bass fishing. A little kid just wants to feel something pull back on his or her line. Don’t project your values on them except for your love of fishing and of the outdoors.